Technical specifications of available CT scanners are often quite extensive. Although it is helpful to review these for each CT scanner component, this may not reflect the relative clinical performance of the systems. It is also important to recognize that the performance in practice depends on the trade-off between image quality and radiation dose. The time taken to complete a scan is a key factor in scanner performance and may limit the type of procedure that can be performed. In most cases, the limitation is set by the need to control artifacts due to involuntary patient motion, such as restlessness, or breathing and peristalsis. 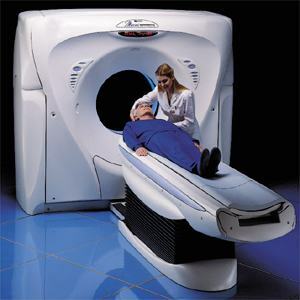 CT Scanner design factors which affect the total scan time are the gantry rotation time and detector array design along the z-axis (scan axis). The maximum scan length is governed by the z-axis detector array design, and the X-ray tube heat characteristics. With the large volumes of data generated with a 64 slice scanner, for example, the total scan length may also be limited by computer memory capacity. The rotation time of the tube and the detectors around the patient has a direct effect on total scan time. Image quality will improve with faster rotation time, as there will be reduced misregistration of data arising from patient movement. This misregistration of data introduces artifacts into the image. The length of the detector array determines the number of rotations needed to cover the total scan length, and thus the overall scan time. Multislice (MSCT) scanners cover a patient volume between 20 and 40 mm in length per rotation, and the latest diagnostic MSCT scanners can image patient volumes of up to 160 mm per rotation. Complete coverage of an organ, such as the heart or the brain, offers advantages for both dynamic perfusion and cardiac studies. The z-axis detector array lengths of up to 80 mm on current scanners are adequate to cover these organs in only a few rotations. A coverage length of 160 mm usually allows complete organ coverage in a single rotation, so the function of the whole organ can be monitored over time. Modern CT scanning techniques place a high heat load on the X-ray tube due to the need for high tube current values, in order to give enough photons in the image when scanning with fast rotations and fine slices. To scan a sufficiently long length, while avoiding overheating, X-ray tubes have generally been developed to have high anode heat capacities and high cooling rates. Some designs have low anode heat capacities, but very high cooling rates to compensate. The principal parameters that describe image quality are: spatial resolution, contrast resolution, temporal resolution, and the prevalence of artifacts. The image quality actually achieved on any scanner depends not only on scanner design features, but also on scan parameters selected and patient-related factors, and will always be a compromise between image quality and radiation dose. Modern MSCT scanners should be capable of achieving isotropic resolution: a z-axis resolution equal to, or approaching, the scan plane resolution, as this is essential for good quality multiplanar and 3D reconstructions. Contrast resolution is the ability to resolve an object from its surroundings. The ability to detect an object will depend on its contrast, the image noise and the size. Dose efficiency of the scanner is a significant factor in the examinations, as it will determine the dose required for a given level of contrast resolution. In CT, temporal resolution is usually considered in the context of cardiac scanning. The aim is to minimize image artifacts due to the motion of the heart. Generator power is an important factor in low-contrast examinations. Low noise images require high tube current values, particularly when coupled with fast rotation speeds and narrow slice acquisitions. Fast rotation speeds improve the temporal resolution and reduce movement artifacts. Artifacts are defined as structures in the image that are not present in the object. An imaging system will invariably produce some level of artifact, but it becomes an issue if it obscures an abnormality, resulting in a false negative diagnosis, or mimics an abnormality, giving a false positive result. Artifacts can be due to patient factors, scanner design factors or the reconstruction process, which by necessity involves some approximations. Doses from CT examinations are generally significantly higher than those for conventional X-ray, although a CT scan provides more diagnostic information. The CT doses may be typically factors of 10s higher for standard head and abdomen examinations, and factors of 100s for chest examinations.